With 93% of pro-marijuana population in US favoring legalization of medical marijuana, high expectations of a greater return for Marijuana stocks, and public actively sharing information about medical, recreational and business aspects related to marijuana, it is no surprise that marijuana culture is thriving on Twitter. After the legalization of marijuana for recreational and medical purposes in 29 states, there has been a dramatic increase in the volume of drug-related communication on Twitter. Specifically, Twitter accounts have been established for promotional and informational purposes, some prominent among them being American Ganja, Medical Marijuana Exchange, and Cannabis Now. Identification and characterization of different user types can allow us to conduct more fine-grained spatiotemporal analysis to identify dominant or emerging topics in the echo chambers of marijuana-related communities on Twitter. In this research, we mainly focus on classifying Twitter accounts created and run by ordinary users, retailers, and informed agencies. 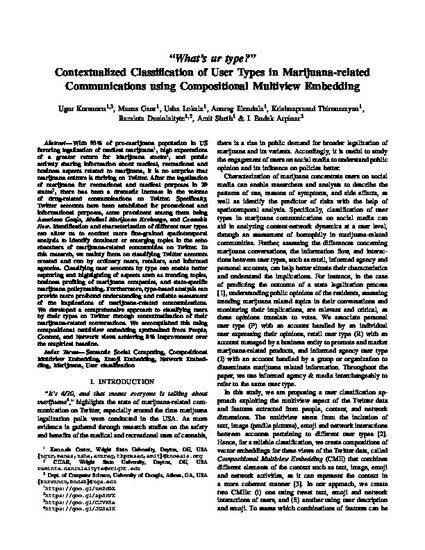 Classifying user accounts by type can enable better capturing and highlighting of aspects such as trending topics, business profiling of marijuana companies, and state-specific marijuana policy making. Furthermore, type-based analysis can provide more profound understanding and reliable assessment of the implications of marijuana-related communications. We developed a comprehensive approach to classifying users by their types on Twitter through contextualization of their marijuana-related conversations. We accomplished this using compositional multiview embedding synthesized from People, Content, and Network views achieving 8% improvement over the empirical baseline.